Disney Kaa from The Jungle Book. 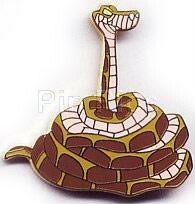 Kaa, the snake from The Jungle Book. He's coiled up with his head sticking up from the center looking right.